SEOUL, South Korea (AP) — North Korea announced Saturday it will suspend nuclear tests and intercontinental ballistic missile launches ahead of its summits with Seoul and Washington, but stopped well short of suggesting it has any intention of giving up its nuclear weapons or scale back its production of missiles and their related component parts. The new policy, which sets the table for further negotiations when the summits begin, was announced by leader Kim Jong Un at a meeting of the North Korean ruling party's Central Committee on Friday and reported by the North's state-run media early Saturday. 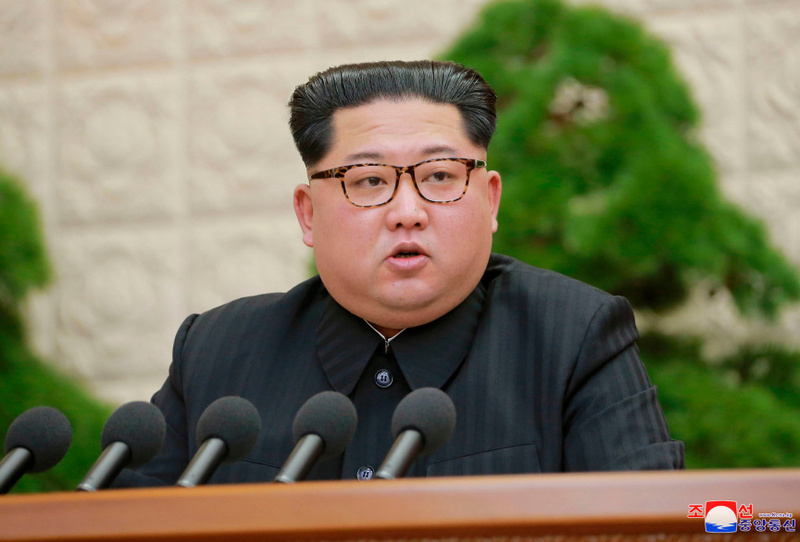 Kim justified the suspension to his party by saying that the situation around North Korea has been rapidly changing "in favor of the Korean revolution" since he announced last year his country had completed its nuclear forces. He said North Korea has reached the level where it no longer needs to conduct underground testing or test-launching of ICBMs. He added that the country would close its nuclear testing facility at Punggye-ri, though that site was already believed to have been rendered largely unusable due to tunnel collapses after the North's test of what it claimed was a hydrogen bomb last year. The announcement is seen as an opening gambit aimed at setting the tone for talks ahead of Kim's summit with South Korean President Moon Jae-in next Friday and U.S. President Donald Trump in late May or early June. Trump almost immediately responded with a tweet saying, "This is very good news for North Korea and the World" and "big progress!" He added that he's looking forward to his upcoming summit with Kim. South Korea's presidential office also welcomed North Korea's announcement as "meaningful progress" toward the denuclearization of the peninsula. Presidential official Yoon Young-chan said in a statement that the North's decision brightens the prospects for successful talks between Seoul, Pyongyang and Washington. Japan's Prime Minister Shinzo Abe welcomed the announcement too but was a bit more guarded in his reaction. "What is crucial here ... is how this development is going to lead to the complete, verifiable, and irreversible dismantlement of nuclear arms, weapons of mass destruction and missiles," he said. "And I will keep a close eye on that." Some analysts believe that rather than denuclearizing, Kim feels he is entering the negotiations from a position of strength and is hoping to achieve tacit recognition that his country is now a nuclear power. They believe he wants engage in talks and make some concessions around the edges that would convince Washington and other countries to ease sanctions on his struggling economy. In his speech at the party meeting, Kim praised his nuclear policy as "a miraculous victory" achieved in just five years. A resolution passed after his speech also stressed that the country had successfully achieved its goals of obtaining a viable nuclear force and suggested it intends to keep that force — at least for the time being. Using the acronym for North Korea's official name, it said the North would "never use nuclear weapons nor transfer nuclear weapons or nuclear technology under any circumstances unless there are nuclear threat and nuclear provocation against the DPRK." "This was a smart move by Kim," said Vipin Narang, an associate political science professor and nuclear proliferation expert at the Massachusetts Institute of Technology. "Although it largely formalizes previous pledges on the moratoria from last November and March, it still leaves a lot of wiggle room for circumventing the pledges in the future, and nothing in there is irreversible. And nothing in there mentions denuclearization, of any variety." Narang noted that North Korea has already conducted as many nuclear tests as Pakistan and India, and may indeed not need to conduct any more underground testing. "The aim of this, in my view, is to make it exceedingly difficult for Trump to say the North is uninterested in talks and walk away," he said. "Kim is doing everything he can now — in a reversible way, mind you — to ensure the summit happens. Because that's his ultimate victory." Tossing out another nugget that could be used at the summits, Kim stressed at the party meeting his desire to shift the national focus to improving the country's economy, which has been hit hard by international sanctions and the "maximum pressure" strategy pushed by Trump. The announcement ends what had been an ominous silence from Pyongyang regarding the stunning diplomatic moves Kim has been making since the beginning of this year, including his first summit, with Chinese President Xi Jinping, last month. Some important items were also left off the North's resolution, suggesting either that the North isn't willing to go that far or that it wants to wait and see how much it can gain by further concessions once actual talks begin. It did not announce a moratorium on short- or mid-range missile launches or ground-based engine testing. It also did not suspend the production of more fissile material to build additional warheads, or the production of the longer-range missiles, which are Washington's primary concern. At the height of Pyongyang's standoff with Washington and Seoul last year, North Korean Foreign Minister Ri Yong Ho told reporters the country could conduct an atmospheric hydrogen bomb test over the Pacific Ocean. That kind of test would also not be included in the suspension.